Cripes! I don't know about you but I am so pleased that the weekend has finally arrived. Having kicked the week off with a healthy dose of jet lag thanks to my flight landing back from NYC first thing on Monday, I have felt a little off balance this past week. So, after a crazy few weeks of work and play, I think it's time I added the third ingredient to the mix - rest! Keen to get outside and breathe in some fresh air, I plan on a gentle stroll to the flower market to take in some colourful inspirations and divine scents. Then I need to go through all my New York City snaps ready to share on the blog, as well as rustle up a special dinner or two. How about you, folks, what are your weekend plans? 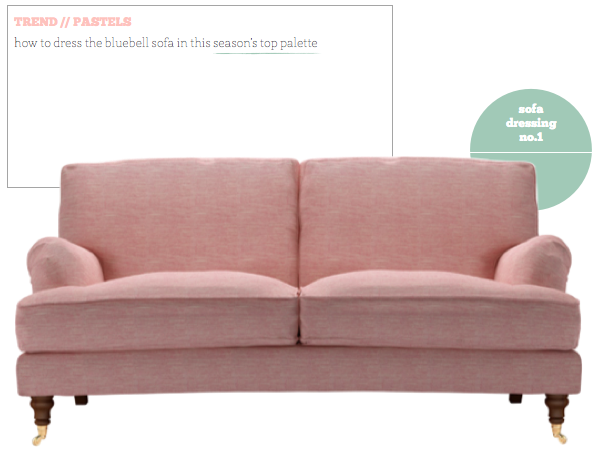 I recently kicked off a blog series over on Sofa.com's Comfy blog about sofa dressing. For the first iteration of the column I focused on this season's pastel trend. 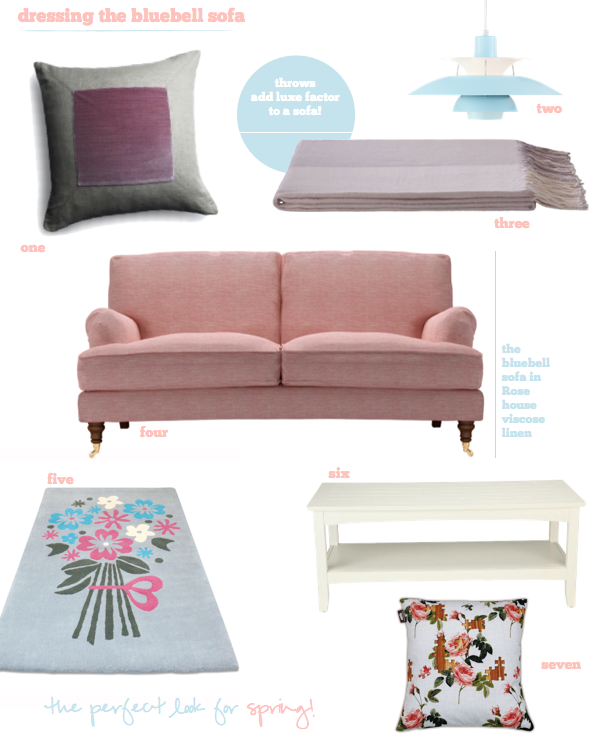 If you like you can head over to the comfy blog and read the full post for my tips on dressing the Bluebell sofa. Have a wonderful Friday, folks! 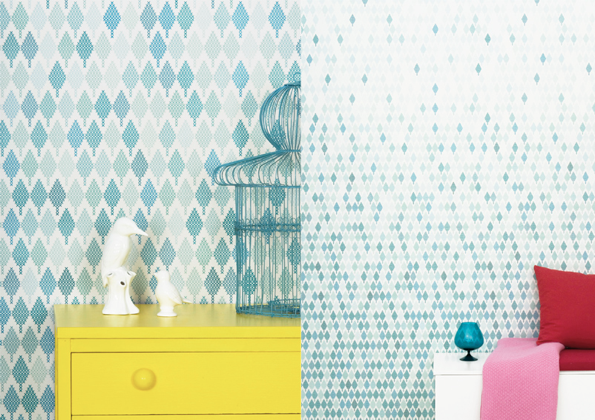 It's fair to say that Maria Bergström's colourful and graphic wallpapers caught my eye in an instant! 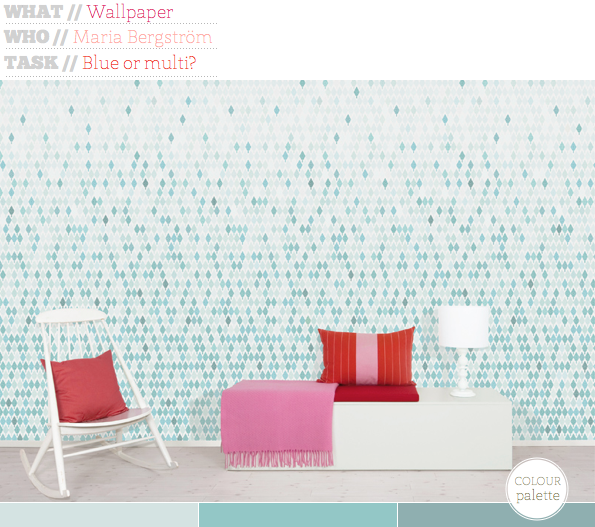 Working out of Stockholm, Maria's work is part of the Studio Rita design collection. 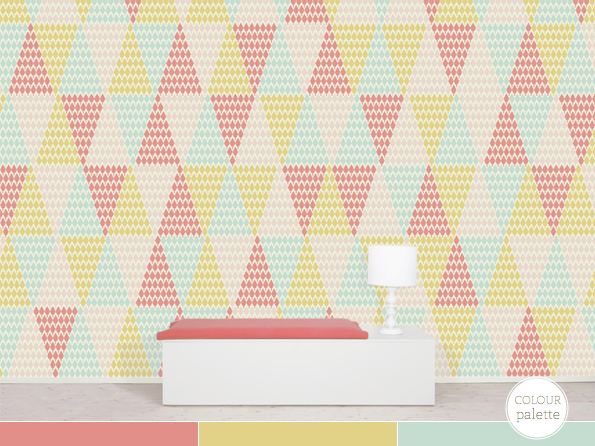 Her designs are such a treat and would be ideal for a using along a narrow hallway for a visual statement, or for a dash of fun to a kid's space. 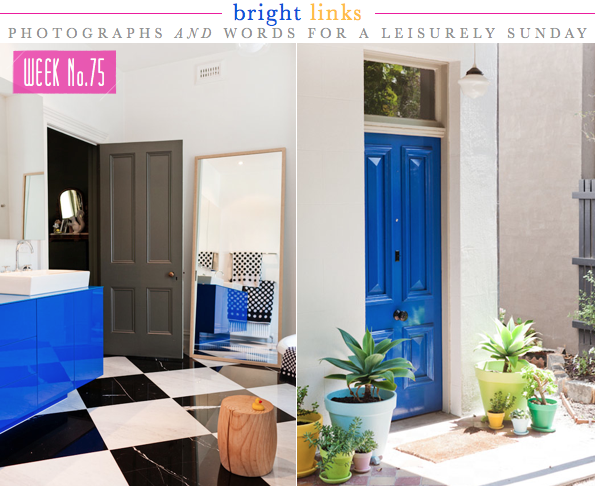 I think the first would be best for a hallway and the second a child's bedroom. What do you think? 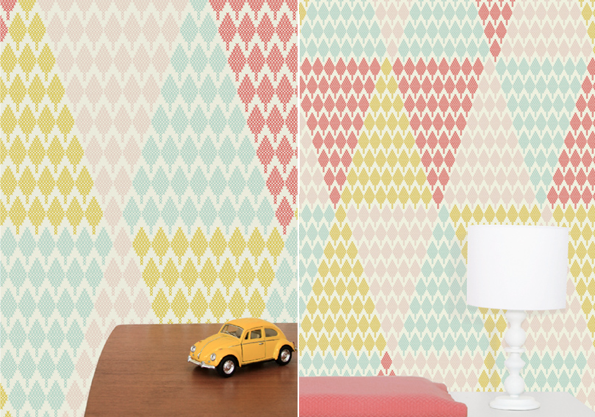 Which wallpaper would you pick? I always get excited when I see a new collection from the folks over at Fired Earth. 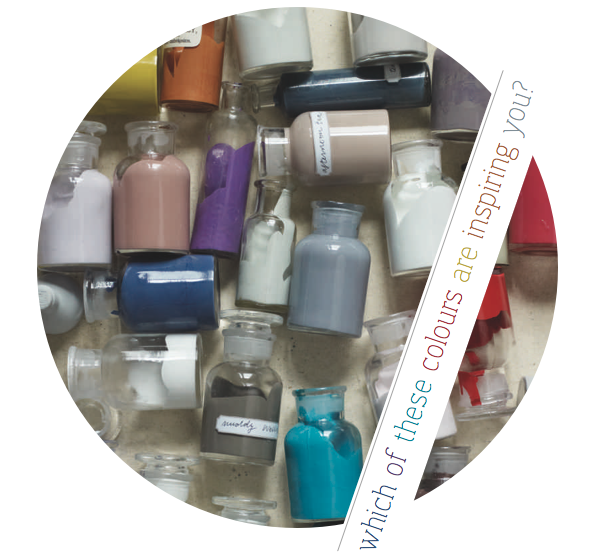 The Paint Collection sees the brand offer a series of 36 paints inspired by travels across the world. 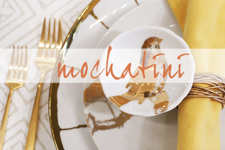 Interestingly, the collection has been edited not to pinpoint a specific era or genre of decorating, rather they create a look that is personal to you, your style and your home. I think the shades would be great for layering up across a scheme. Look out for the divine, rich pink hue of Evening Glove, the playful yellow hue of Hustle at 5pm and the ideal summer colour, Mrs. Booth. 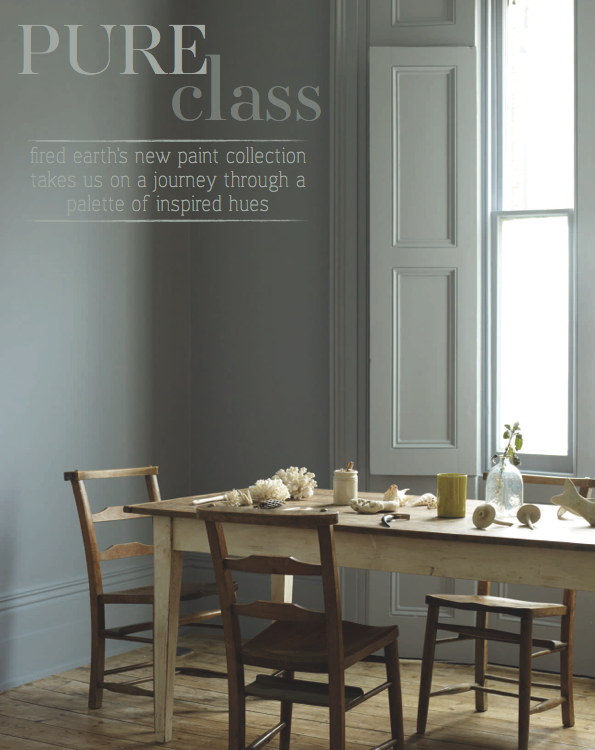 Which spaces or colours from Fired Earth's new paint collection are inspiring you? 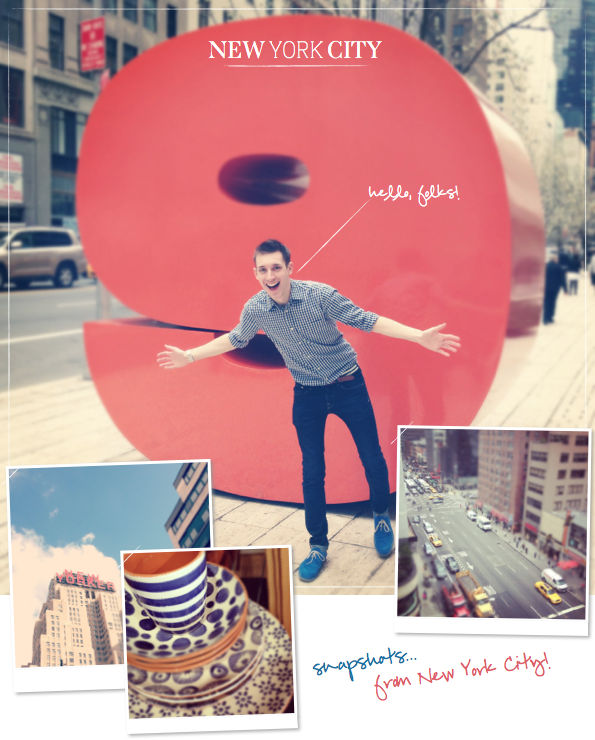 A Quick Hello: New York City Snapshots! Hello there, friends! I landed back into London from New York City yesterday morning, so right now I'm taking it easy and recovering from a serious hit of jet lag. (Yikes! I always forget how bad it is traveling back to London from the States.) I wanted to drop in to say that I hope you're all keeping well and I'm looking forward to catching up with your blogs over the next few days. New York City treated me as wonderfully as she always does and I can't wait to share a full round up of the trip here on Bright.Bazaar soon. I'll be back tomorrow; until then, keep it colourful! 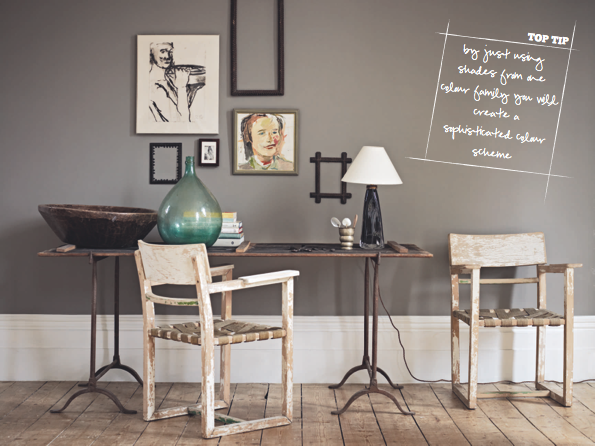 I talked home offices over on the Laura Ashley blog. Great ideas for organising cords. Lovely tour of Fay Andrada's home. 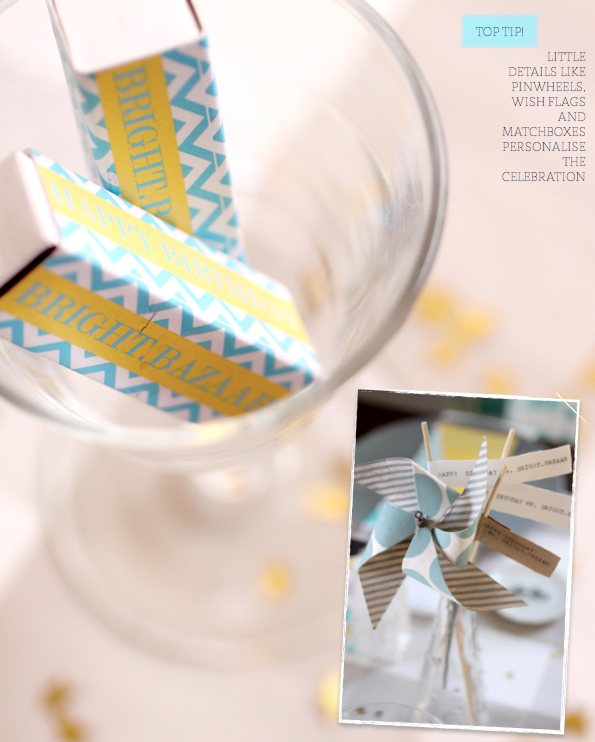 A simple and pretty little Easter DIY. 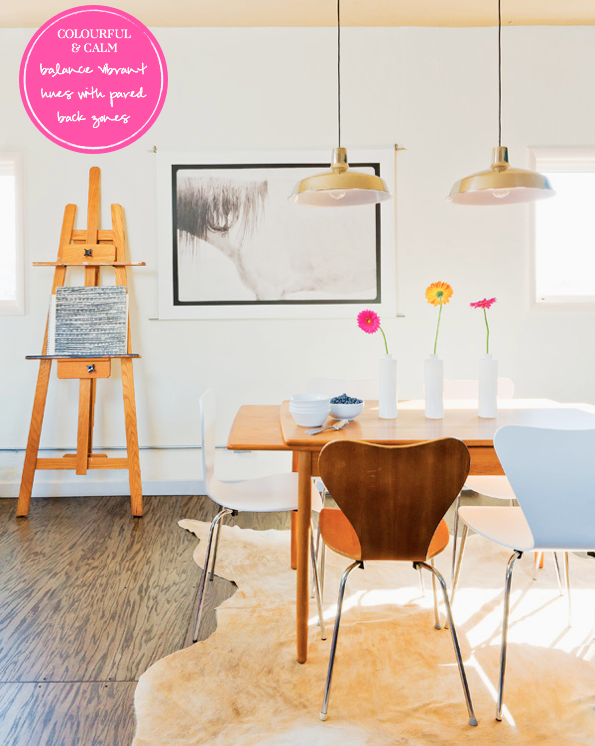 Love the hot pink accents in this home tour. Need to try and make this spicy black bean burger. This is such a cute store for dog owners. Sarah and Lou's home has some lovely colours in it. I'd like to visit Sausalito one day. 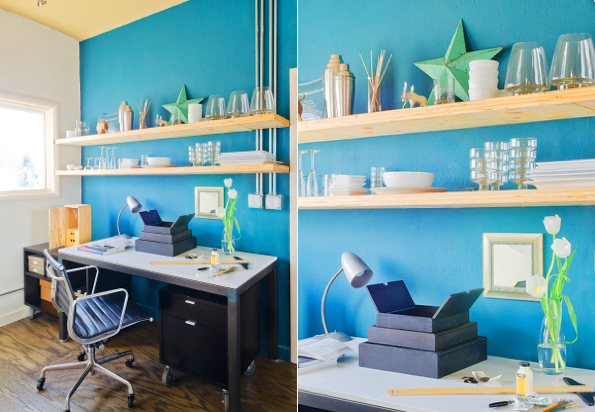 Industrial & colourful loft tour. 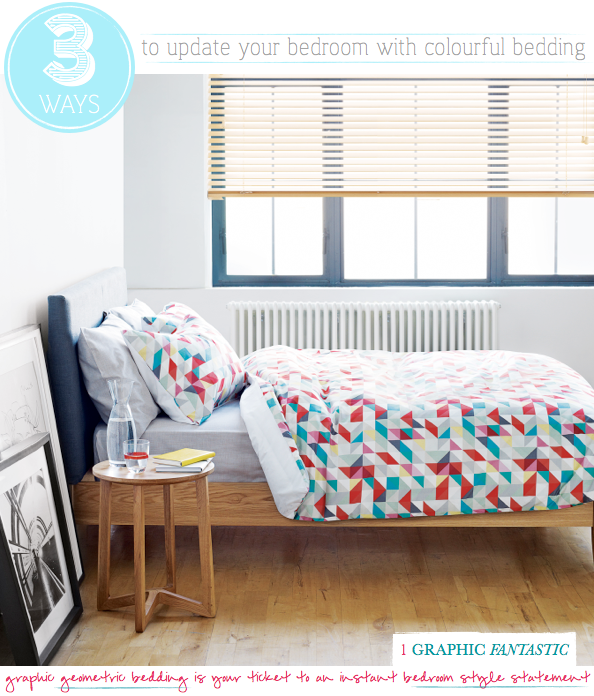 Three ways to make a statement with bedding in the bedroom. 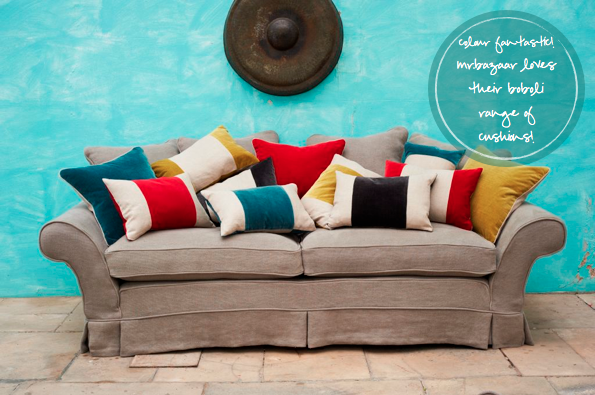 Colour up with sofas, beds and cushions. Adding colour with stools in the dining room. New York City is such an inspiring place, isn't it? There's an energy and vibe to it like no other city I know. I love how the sunshine shimmers upon the mass of glass skyscrapers, dancing from pane to pane as it sets. I love the brownstone buildings and the omnipresent iron fire escapes. I love the bright yellow taxis. I love the calm of Central Park. I love the rush of air on your face as you walk across the Brooklyn Bridge. 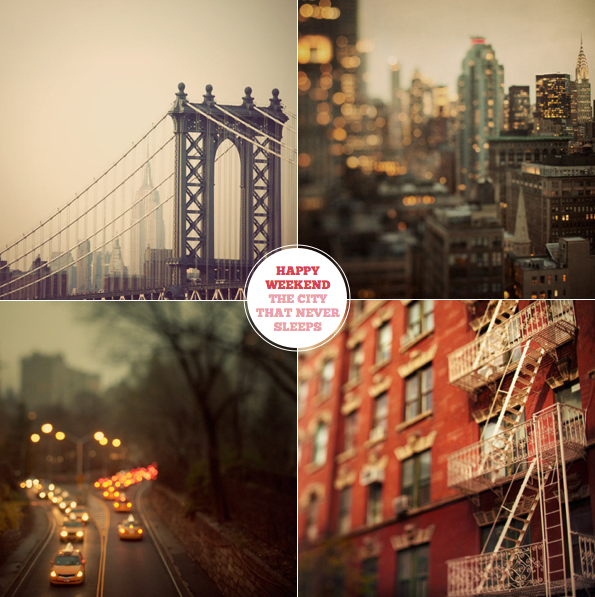 I love New York City! And do you know who perfectly captures this city's spirit? Irene Suchocki. Check out her beautiful prints here. 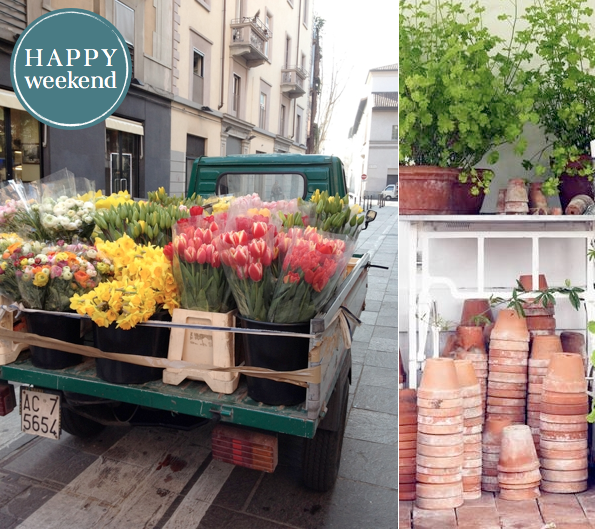 Have a wonderful weekend, friends! The mix of colour and texture in this dining area is spot on, don't you think? By keeping the main pieces of furniture - table, sideboard, shelves - simple and pared back allows for an array of hues around the table in the stool legs. 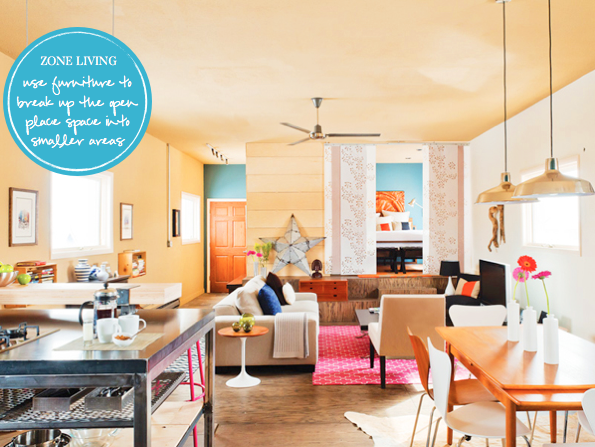 Adding colour in this way means you can be more adventurous with your choices because the hues are accents to the space, rather than serving as a base palette to the whole room. Play with texture by mixing together upholstered and wooden stool tops. This mix of tactile elements adds interest to the space. 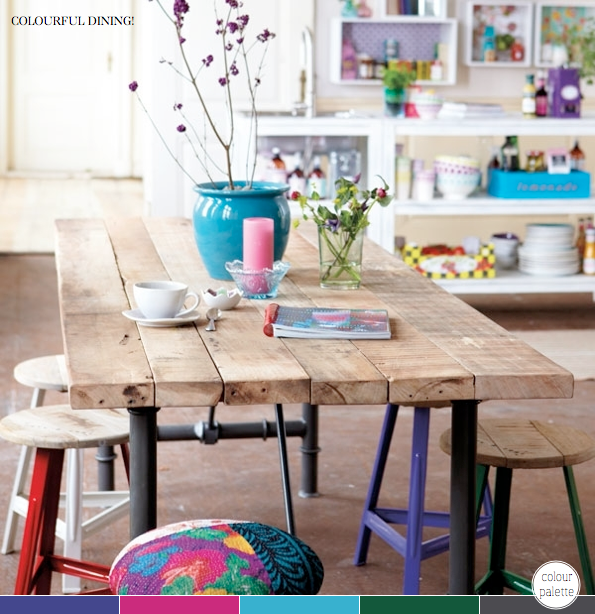 Have you ever added colour with stools? 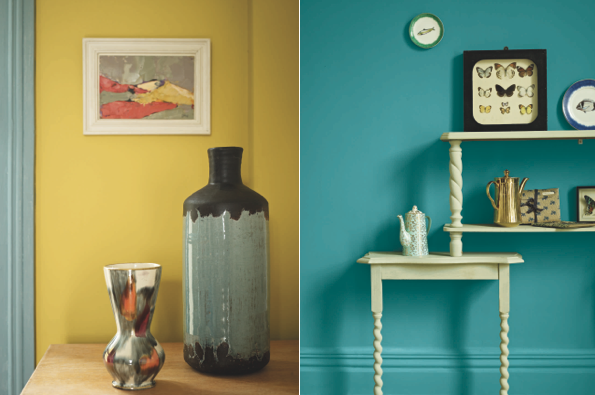 What are your tips for adding colour to dining areas? 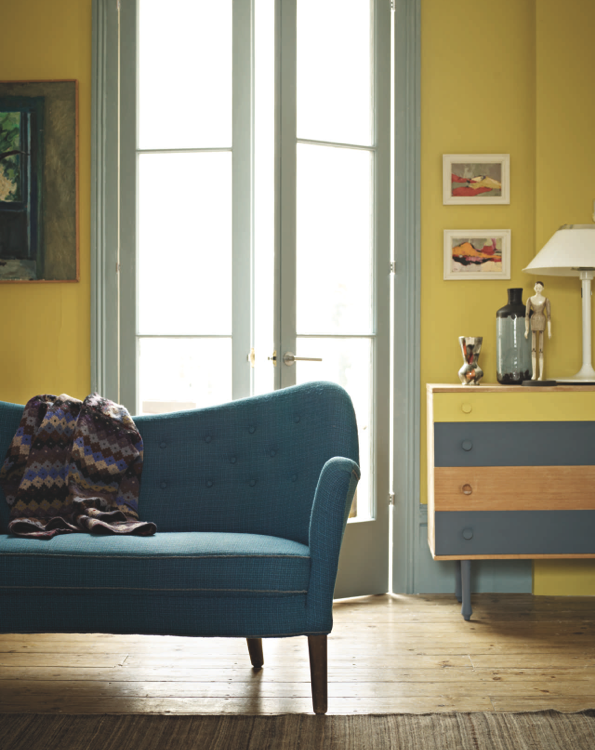 Colour Up With Sofas, Beds and Cushions! 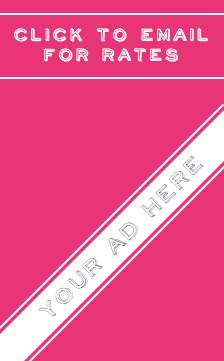 Sofa.com | Sponsored post but all opinions my own. OK, folks. Listen up! 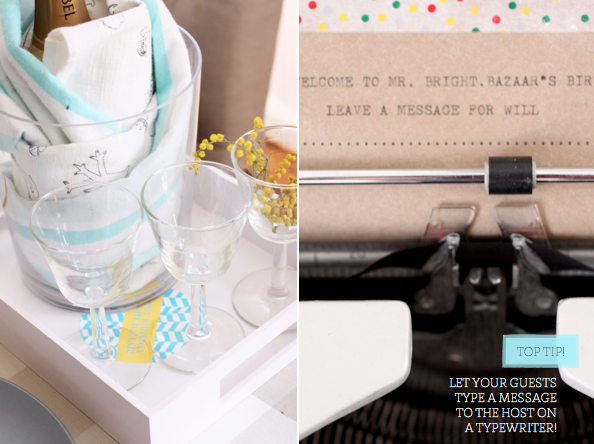 Mr. Bazaar has the perfect name for you to add to your little black book of great furniture and home accessory stores. 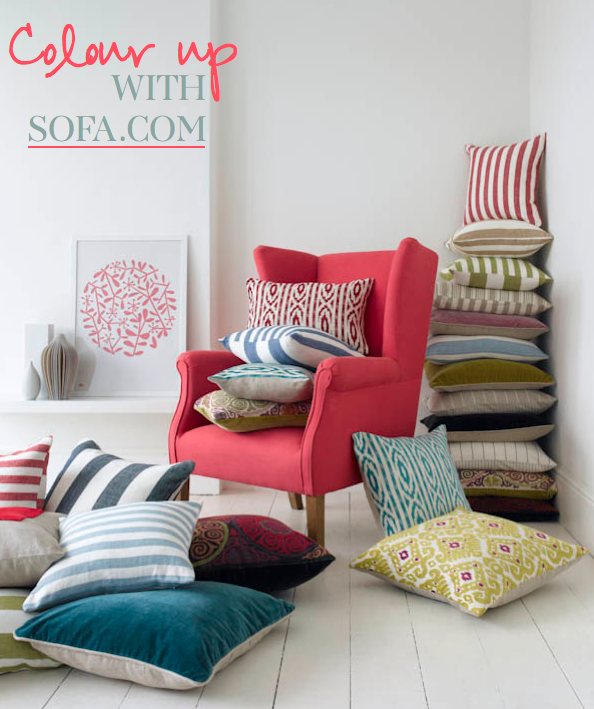 Sofa.com are a fantastic online that offer you the chance to buy any of their armchairs, love seats, sofa beds, two seaters or three seaters in any fabric you like - how great is that?! 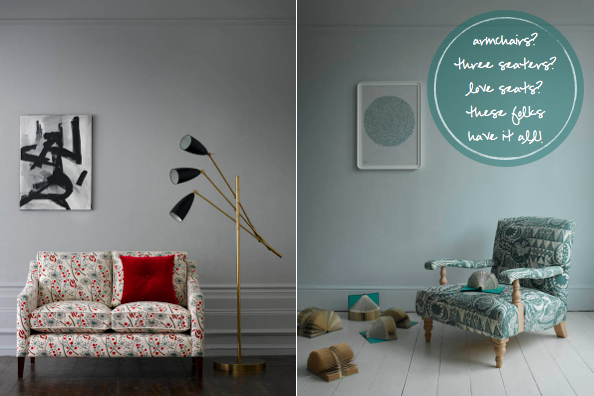 I love that fact you can customise any of the sofa styles with your personal fabric to make a piece perfect for your home. 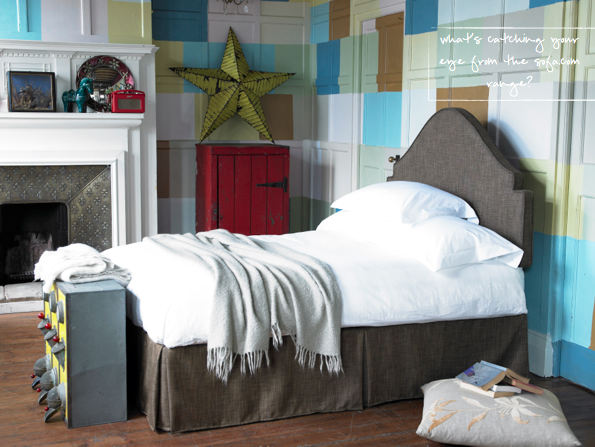 Plus, Sofa.com also do the same for the upholstered headboards and storage beds from their bed collection. Guess what's even better is that most of their items are sold at 30% less than what you'll find on the high street because they cut out costs by selling online. Just what Mr. B likes to hear! 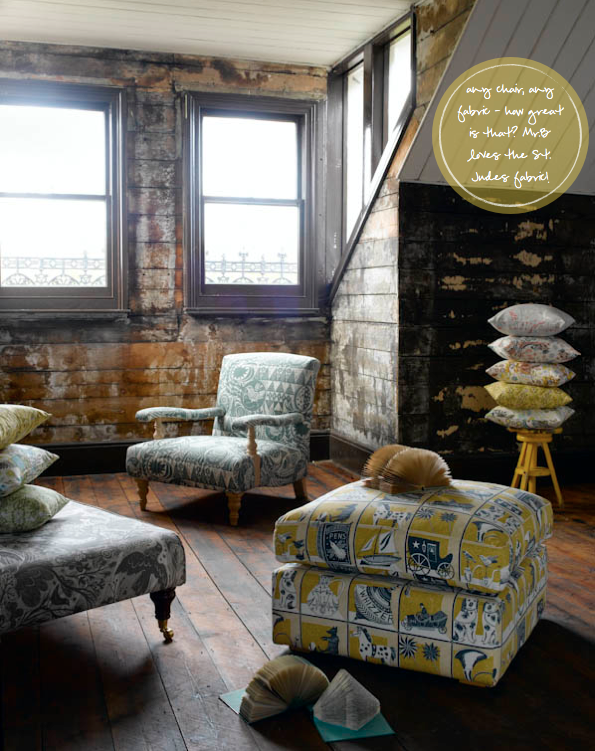 So, once you've treated yourself to a new sofa or bed, why not pick up a cushion or two to dress it with? What's catching you eye, folks? 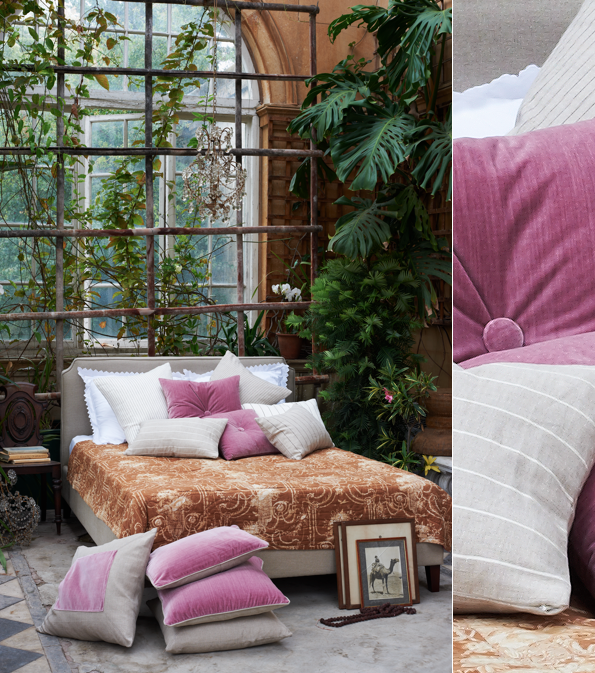 New bedding is an ideal quick fix for a new look in your bedroom and truth be told Mr. Bazaar is somewhat addicted to adding to his ever-growing collection of sheets! 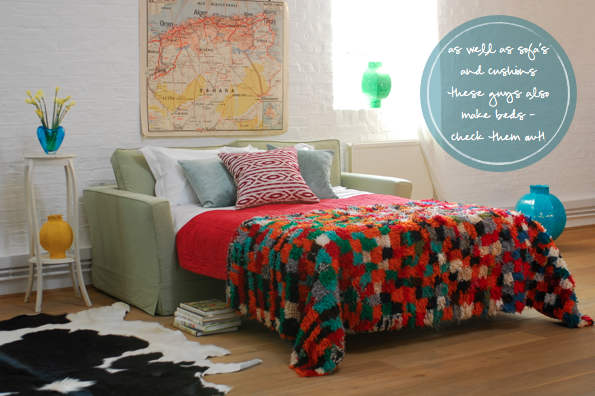 Given we spend so much of our lives, well, sleeping, it makes sense to invest in good quality bedlinen. Once you have the basics (think a bank of colour block fitted sheets and pillowcases), then you can think about switching up the look and feel of the room as the seasons change. 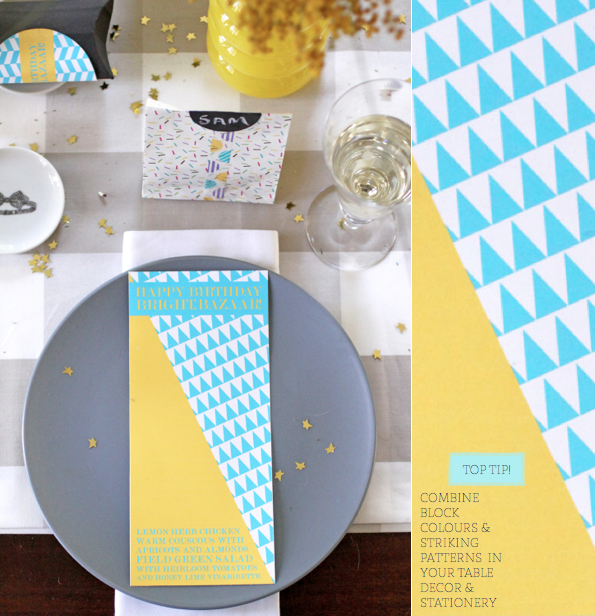 Perhaps you'll opt for Graphic Fantastic to add pizazz and spice to an otherwise calm and pared back space? Or maybe you're keen to keep things on an even keel with your partner?! 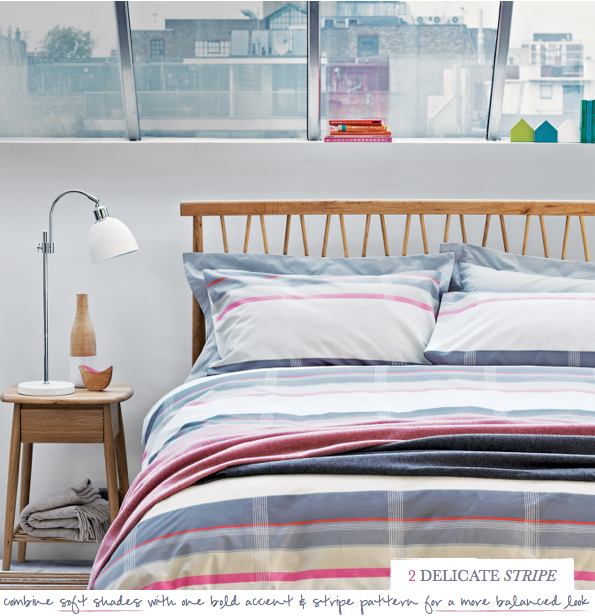 Delicate Stripe shows how a stripe pattern made from a mix of softer hues with one bold accent colour creates a good balance between a masculine and feminine scheme. 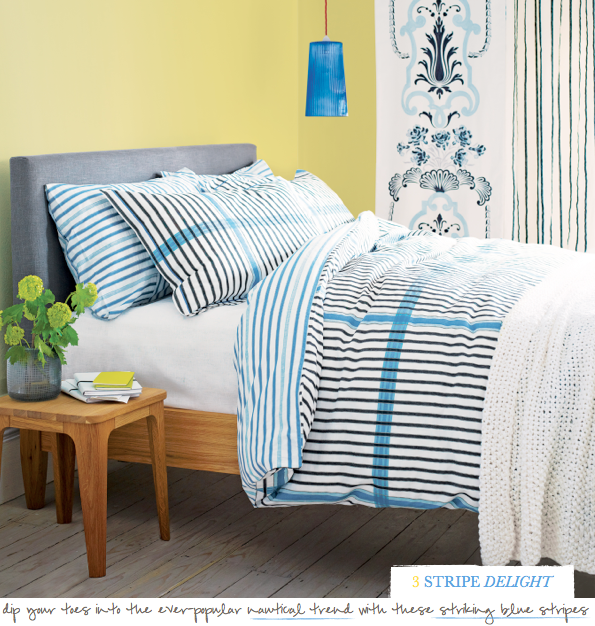 Finally, colour and pattern lovers may well choose Stripe Delight for its nod to the ever-popular nautical trend, delivered here thanks to a series of striking blue stripes. 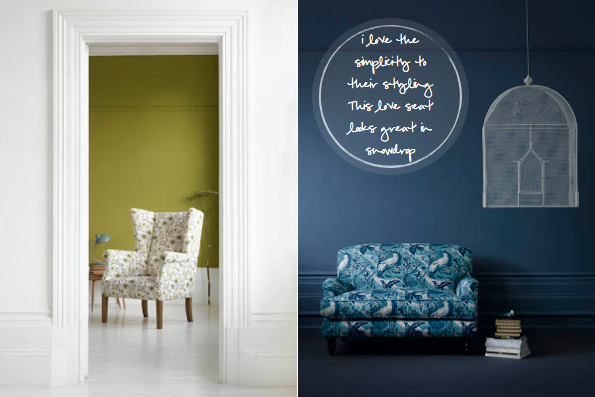 Three different ways to a bedroom style statement but which way is for you, folks? 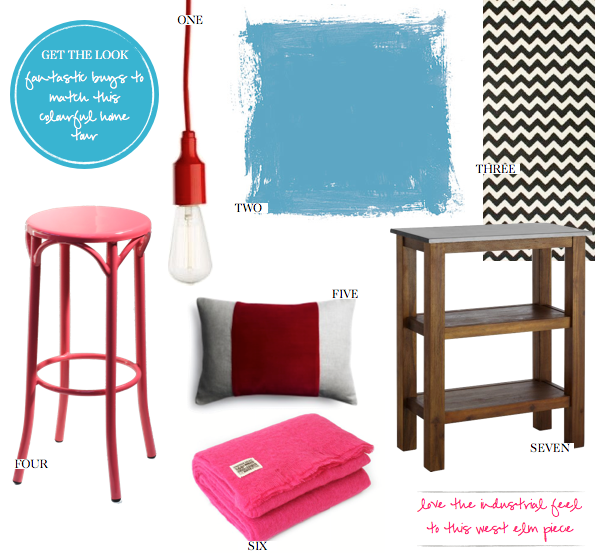 The two themes in interiors that I gravitate towards the most are colour (funny that!) 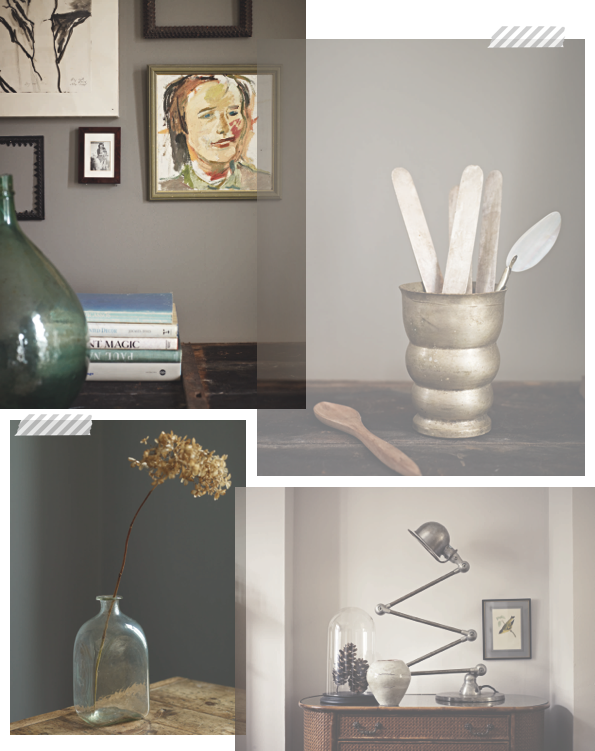 and industrial elements, so I love it when I see a the two brought together in one space. 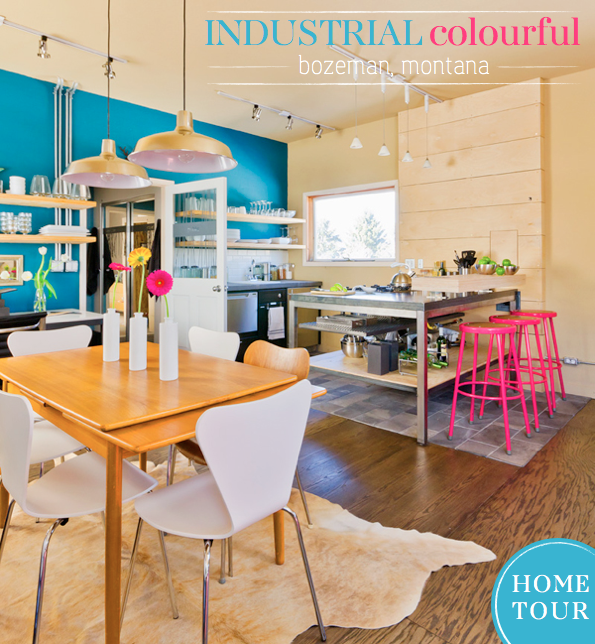 Interior designer Susie Hoffmann did just that when she converted a 1930s flour mill near downtown Bozeman, Montana into her home. At only 1,000 square feet the former office space is open plan, incorporating a kitchen, dining and living room and office into one room. Clever design elements such as open shelving to display dishes in the kitchen and birch walls in the bedroom for closets offer plenty of storage. 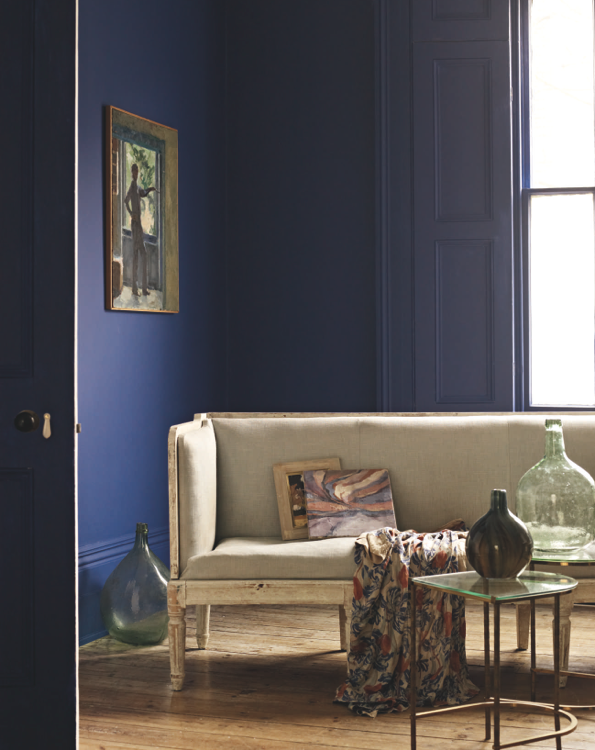 The colour palette was inspired by the building's location around the mountains of Montana and the surrounding blue sky - Farrow and Ball's 'Cooks Blue' is a great match. 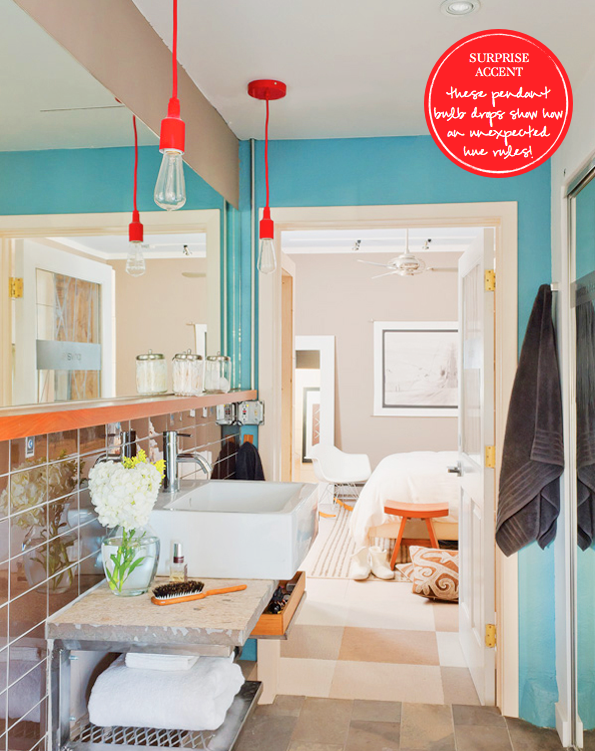 Hot pink hues and a surprise red accent in the bathroom have been added to keep the space from feeling flat. 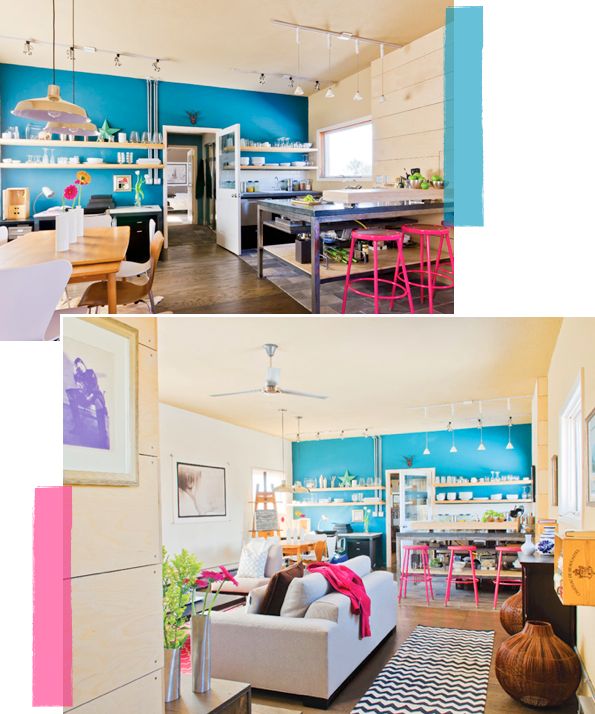 What do you like about this colourful loft? 1. This beautiful combination of fuschia and yellow inspired me whilst out walking in the park. 2. I was excited to see one of my tweets in the current issue of Anthology magazine. 4. Love the colours and stripes in these traditional Turkish bath towels. 5. Krispy Kreme doughnuts taste pretty darn good! 6. 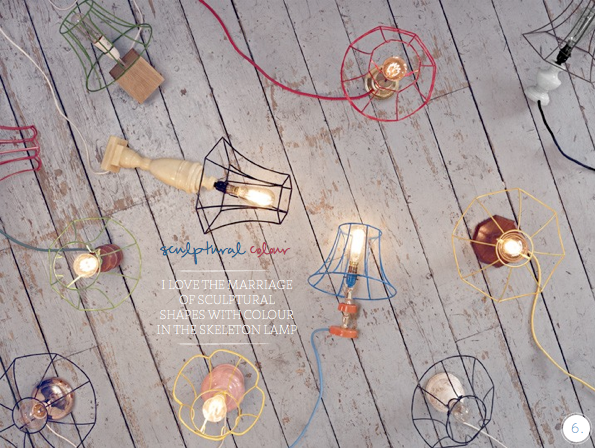 I really like these sculptural table lamps by Donna Walker. 7. Malene Helbak designs rather lovely earthenware. 8. This Jansen's & Co. cake stand is a fun way to bring colour to afternoon tea. 9. I like the orange sole on these flip flops - roll on summer for some beach days! 10. 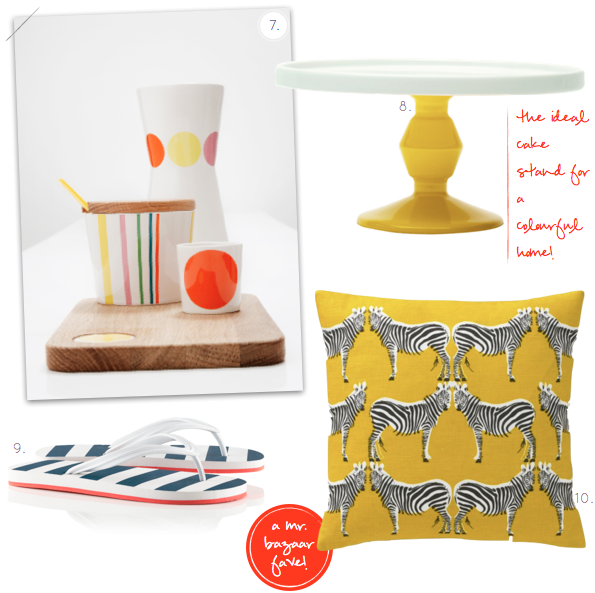 A yellow cushion with Zebra's printed on it? No need to ask Mr. Bazaar twice - yes, please! 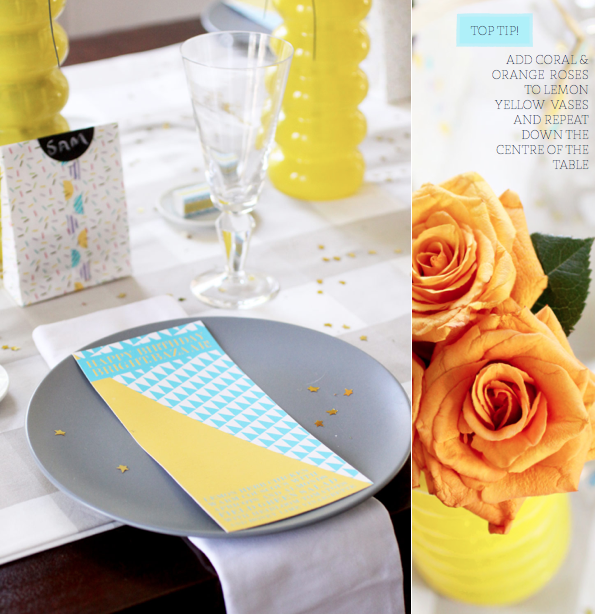 My guest post on colourful dining. Matthias Heiderich's photographs make me so happy! 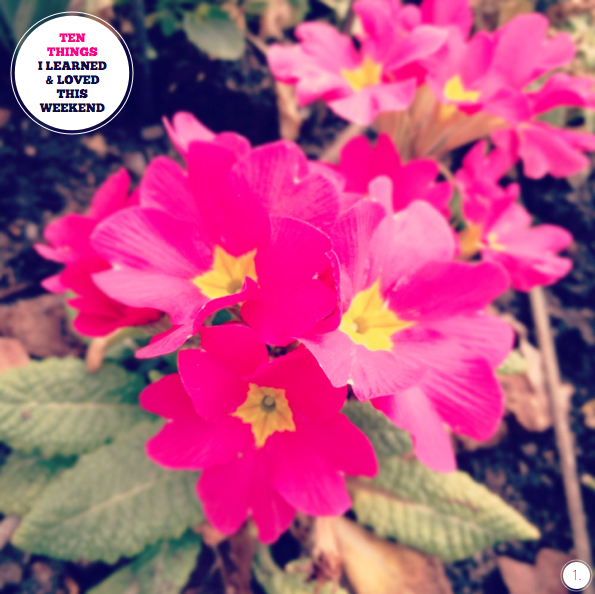 Rachel shared beautiful snaps of her old stomping ground. 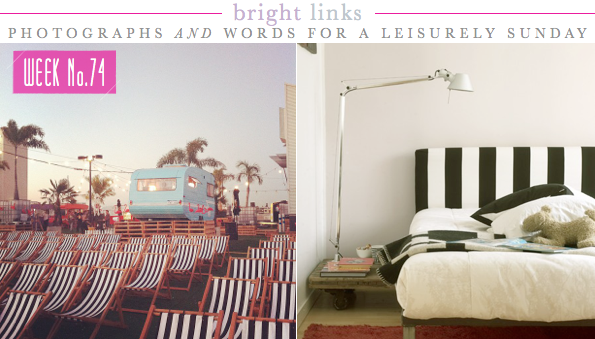 Peggy shared these awe inspiring photographs on Wayfare's blog. 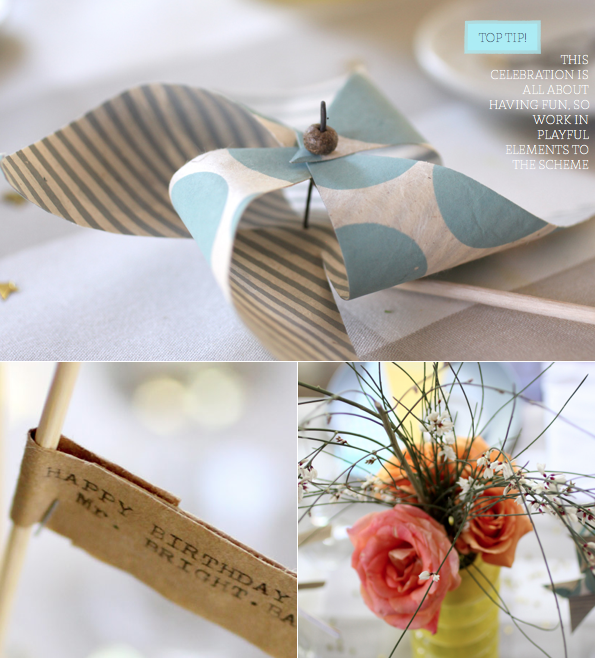 Tips on aperture for photography. The Shop at Number 57 opened their virtual doors. 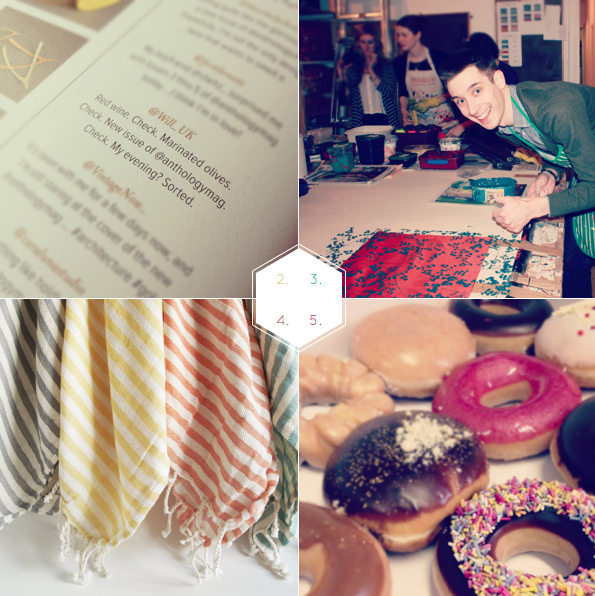 An inspiring round up of blue features. The most beautiful photographs of Seville, Spain. Last weekend I did an IKEA hack for my kitchen, bought a new tea towel, found the perfect bag and much much more! Milk Farm Road released their March collection. I dreamt of being here on my birthday. 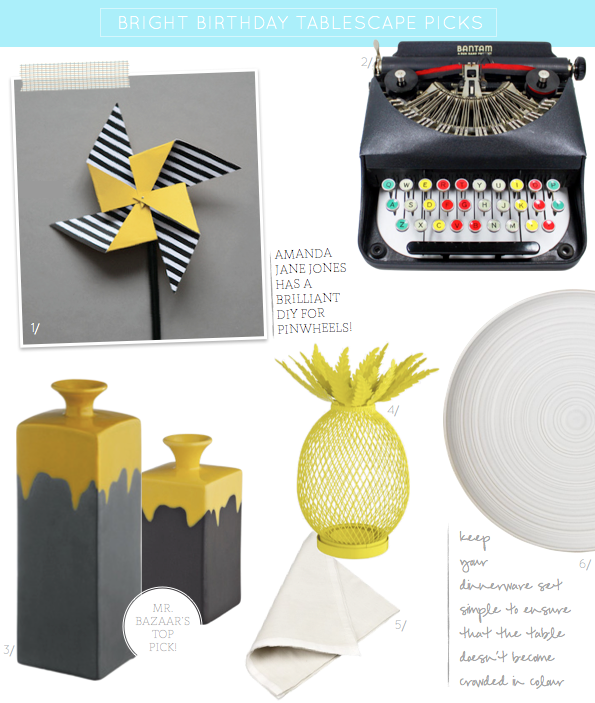 A peek inside Heart Home magazine. 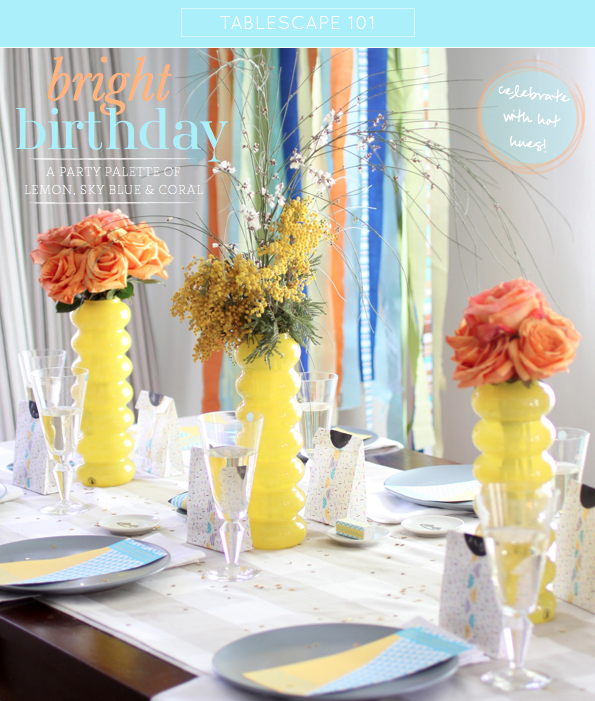 Tablescape 101: A Bright Birthday. 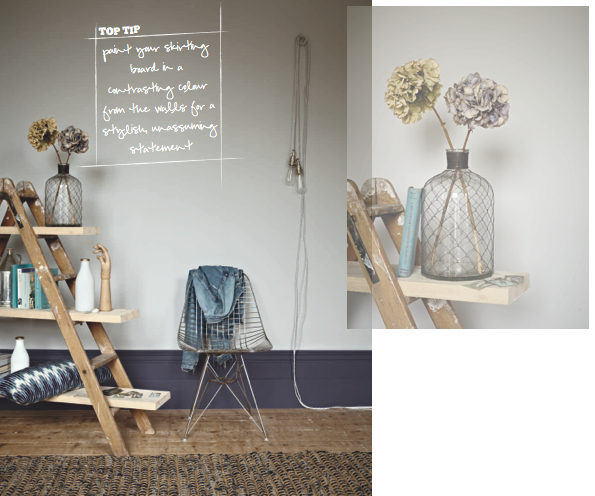 Having worked as a visual merchandiser and tipped my toes into a prop styling I know how important the details are in interiors. Never more so than in the kitchen. After all, you wouldn't want to ruin beautiful cabinets with terrible hardware! 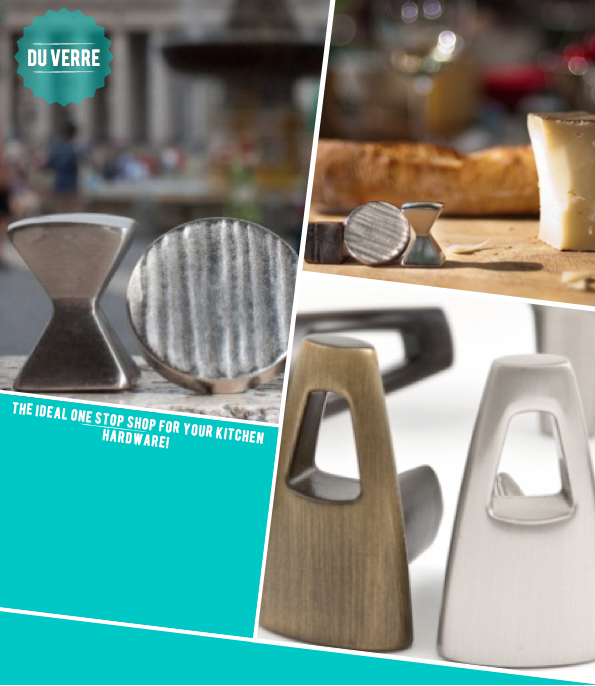 That's where kitchen hardware company, Du Verre, come in as these folks specialise in just that - kitchen hardware. Du Verre use a selection of different designers to ensure they offer a range of hardware that works in many different kitchen styles, such as the Primitive and Tribal ranges. Even better? The handles are made entirely from recycled aluminium, upping the company's green credentials. Using this recycled metal reduces the energy requirement needed to manufacture their hardware and by not producing new metal they are reducing the amount of greenhouse gases emitted. Gold star! For many of us north of the equator, the days are drawing out and the sun shining for a little longer as we move deeper into spring and closer to summer. 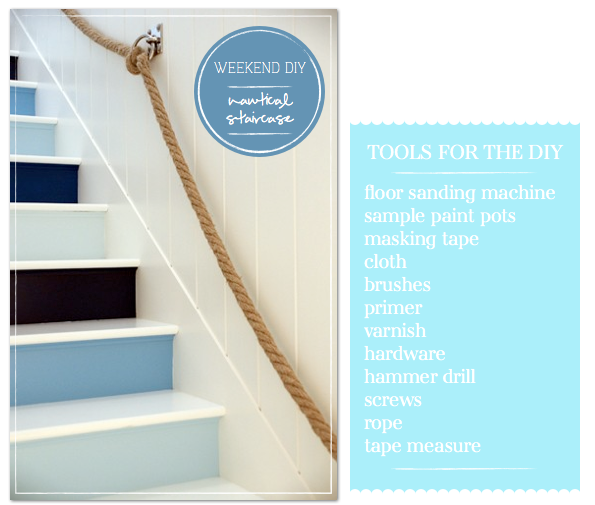 Given nautical themed interiors are always popular for the spring/summer season, I think this graduating blue staircase is the ideal DIY for this time of year. Easily achieved in a weekend, I would start preparing your wooden staircase by sanding it down then wiping clean with a cloth before coating everything with several coats of primer. After the final coat of primer is dry, paint the stairs in a matt white eggshell. Once dry, number each stair front with a pencil to ensure the number of graduated colours matches how many stairs you have, matching each number to one of your paint colours. Next, section off the individual stair fronts with masking tape and paint inside the lines. When dry, peel the tape off carefully and then seal with several coats of floor varnish. Finally, add a rope for a handrail by tying it to hardware rings for a finishing nautical touch. So fun! Have a great weekend, friends! Remember my post about a walk through the woods? Well it's the first thing I thought of when I saw that Rotsen Furniture were going to sponsor Blog Tour NYC. Rotsen Furniture create sculptural designs that integrate the natural organic characteristics of wood with a clean and modernist aesthetic. In fact, they start each project by taking inspiration from the design from the individual piece of wood itself. What caught my eye? Their natural wood stool, for sure. Why? I think it's the perfect piece to demonstrate the expert craft of Rosten Furniture. 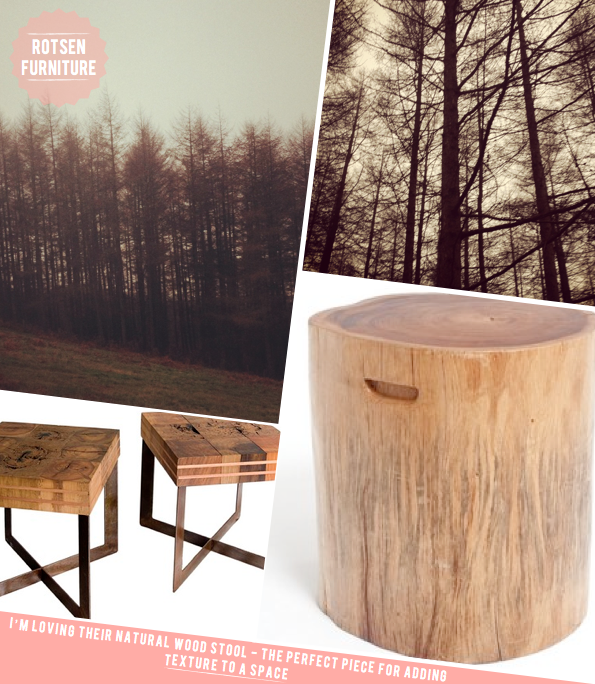 Full of texture and character yet modern at the same time, the stool would be in my home without a second thought! Rotsen Furniture's client list is more than a little impressive, including Four Seasons, Mandarin Oriental, Hyatt and W Hotels. Plus, these folks are dedicated making the world more beautiful and comfortable, as well as protecting environmental sustainability and the use of renewable sources. How do they do this? They utilise reclaimed materials from decaying bridges, old barns and demolished structures, giving the found objects a new lease of life as their designs. Great job, guys! Scholtes are another of the kind sponsors for Blog Tour NYC. What makes this company special? 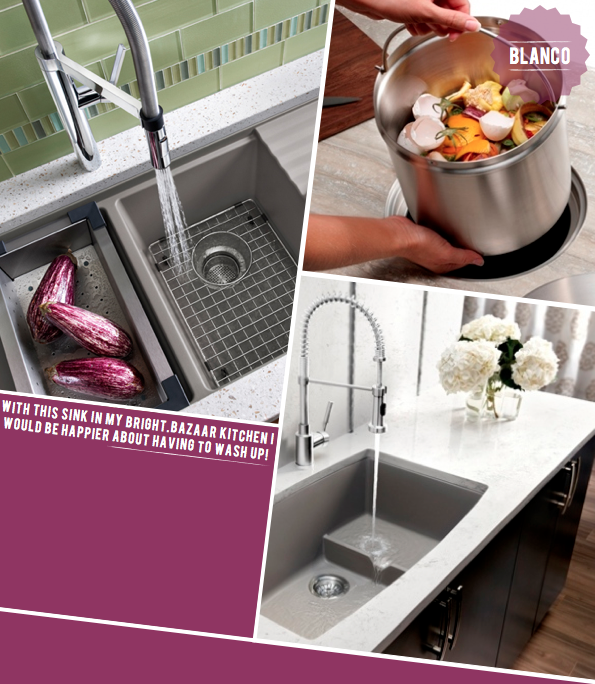 Well, their appliances combine fine European design in American sizes with the highest professional quality. I mean, who wouldn't want a Scholtes' wine fridge and refrigeration drawers, right?! I'm often bending down to reach for produce from my compact half-height fridge, so the thought of having their refrigeration drawers really appeals. And whilst I'm on my kitchen appliance makeover, let's also add one of their sleek, modern built-in coffee makers and ovens to the mix, you know, just for good measure. After all, everything has to match! 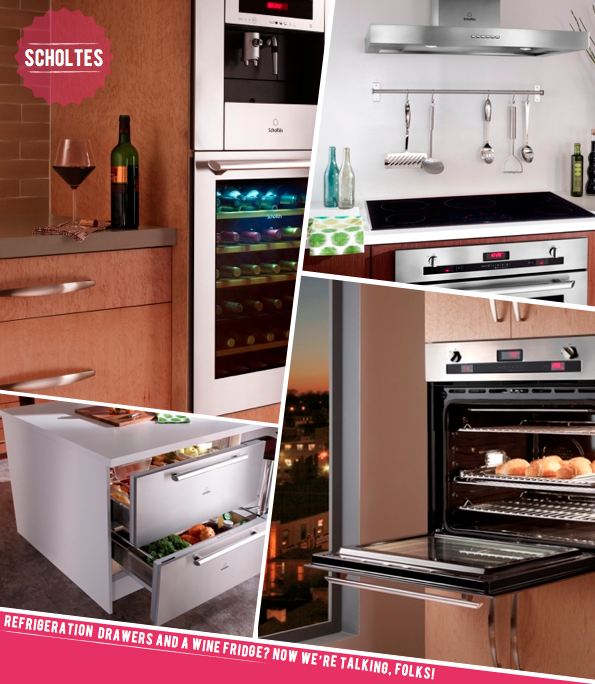 ;) You can read more about Scholtes' great appliances on their website.